Either grill your bacon on a rack, or pan fry it and leave it to sit on paper towelling to draw off excess fat. While your bacon and eggs are on the go, toast your bread. 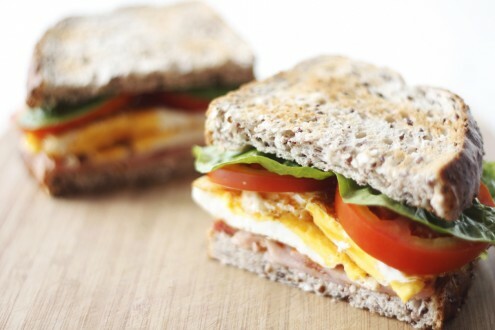 Assemble your BLET at the last minute when the eggs and bacon are still warm. You could also serve a few dill pickles on the side. Tip: This is a tasty idea for a picnic lunch. Post-GDM suggestion: Replace your bread with a toasted turkish roll and add a good slathering of mashed avocado and barbecue sauce onto the bread before final assembly. I am a vegetarian and am impressed with the selection of recipes on your website (we are often overlooked!) and love your suggestions for turning meat dishes into veggo ones. Do you have any tips for seasoning tofu to make a yummy TLAT? Hey Erin. Thanks! And I’ll keep the vegetarian options coming. Try seasoning the tofu with a cumin & smoked paprika rub. If you’re non-GDM you could also add some delicious chutney. AMAZING!!!!!!!!! My friend just found out she has GDM… and I want to make her a great dinner… and I’m trying to find a dessert that is going to hit her sweet tooth… do you have any suggestions?? Thanks much for this wonderful site and going to try ALL recipes (of course not all in one night). I want to eat this picture right now..
Made these for breakfast and they are definitely delicious, My hubby and Dad thought so as well.